Hope, an endangered Sumatran Orangutan, was found in horrible condition by rescuers. When they took her in, they realized she was not only suffering from various infections and broken bones, but she was also blind. Her injuries weren't natural. They were caused by cruel men who, for some reason, used her body as if it were a bullseye and riddled her with bullets. After undergoing an X-ray, rescuers found a total of 74 air gun pellets lodged inside her. She also had a smashed collar bone and an infected air sac. Some of those bullets had blinded her and left her unable to search for food. She was on her way to starving to death when she was discovered, but by that time, it was already too late for her one-month-old son who starved to death. 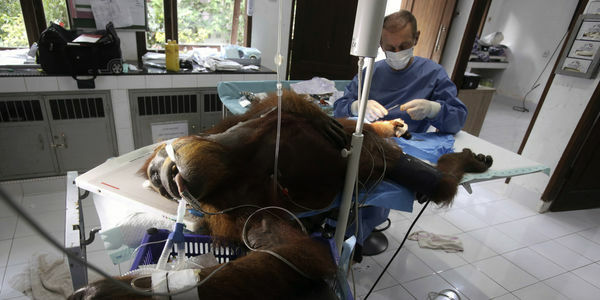 According to the Sumatran Orangutan Conservation Programme, these pellet gun attacks are not uncommon. Over the past decade, they have had to rescue at least 15 of them, with a total of 500 air pellet wounds. Hope is just the latest victim. Now this beautiful "person of the forest" will have no other choice but to live the rest of her days in captivity, in darkness, cared for by animal rescuers. This yet another sad chapter in the story of the vanishing orangutans. At latest count, there were little more than 13,000 of the primates left. They are being pushed out of their habitat by clear-cutting for palm oil, killed by poachers and threatened by a host of other issues. Without serious protections, they will soon disappear and we will never get them back. That's why it is so important for Indonesian authorities to take the maiming of Hope extremely seriously. They should do everything they can to find and punish the people who did this to her and caused the death of her child. Please sign the petition and demand justice for Hope. Sign and tell the Ministry of the Environment and Forestry to continue their search for Hopes attackers.